6.1 grams of pure 999 fine silver with gold leaf inlay and black powder coat eyes. My first frog! This one was a custom request and I was challenged as to how to design. “Can you make me a frog” is a pretty broad statement and there are so many ways to run with the design. This incredible feat of sand casting was a challenge for sure. Getting silver to flow into the legs properly requires a whole lot of vent cuts, I heated the silver a little more than usual and poured as fast as I could. I was ecstatic when I opened the mold to discover there was a result I could actually shape into a nice piece of jewelry. I made a small rectangular cut on the head, inlayed gold leaf and sealed with crystal clear then, polished to a seamless transition and shine. I could not figure out what to do with the eyes. I considered drilling them out and inserting black onyx but, too much for such a small dot which, will most likely go unnoticed so, I used powder coat mixed with crystal clear and boy, did that work well because the eyes pop well next to the gold and they are smooth and shiny like the rest of the piece. I am very proud of this item. 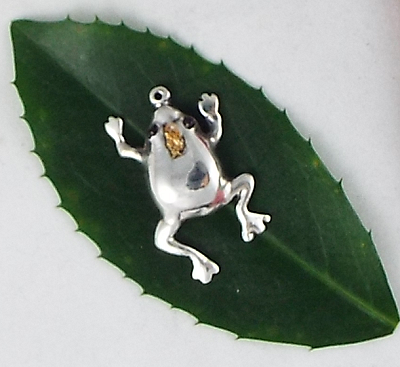 Here is a pic I took with the frog on a leaf randomly picked from outside my shop.